The new regenerative heat exchanger is referred to as "Pebble-Heater" - a name already known in technical practice. It is filled with bulk material consisting of spherical pebbles and may operate at high temperatures to heat and cool gaseous media. The differences towards the state-of-the-art start with the flow direction: the fluid flows radially through the pebble-bed which is fixed between two concentric, permeable cylinders, referred to as hot and cold grid. 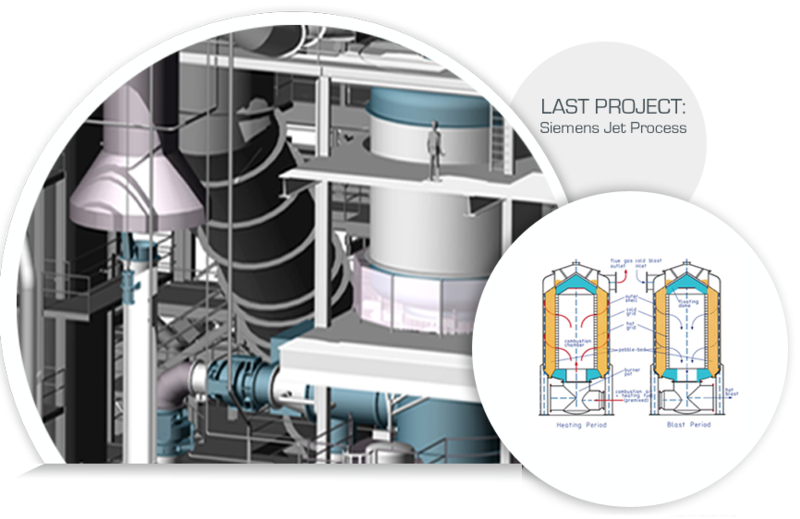 "SIEMENS Jet Process - Press release"
"Pebble-heater twins with fluid dynamic valve - an efficient possibility for high combustion air preheating"
"Decentralized biomass power plant based on pebble-heater technology and hot air turbine (SiPeb©)"
"Innovative biomass power plant based on pebble-heater technology and hot air turbine"
"BIOMASS CHP BASED ON GAS TURBINE PROCESSES"
A pebble heater with an energy efficiency of more than 95 percent is used to create the hot blast.